Adjustable Heels? Yes oder No? I Liebe my stiletto, in fact, I have sacrificed a broken toe for them before. I, like may women, Liebe my shoes and wouldn't give them up for anything, but if I could choose to have comfort and fashion why not? So, for my business class we had to come up for an idea for a re-design of a product and see if it would be marketable. 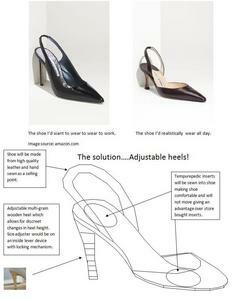 Here is my idea for a new shoe with adjustable heels. Let me know what Du think (be honest Du won't hurt my feelings :) )! Thanks! Go for it girl do what your herz and mind tell Du to do and don't take no for an answer but big shoe stores might not want to buy it because they make their profit off of people buying multiple pairs of shoes not just one. But Du should definitely go for it!